Zurich labours under the misconception that it is nothing more than a sterile banking city – don't believe a word of it. 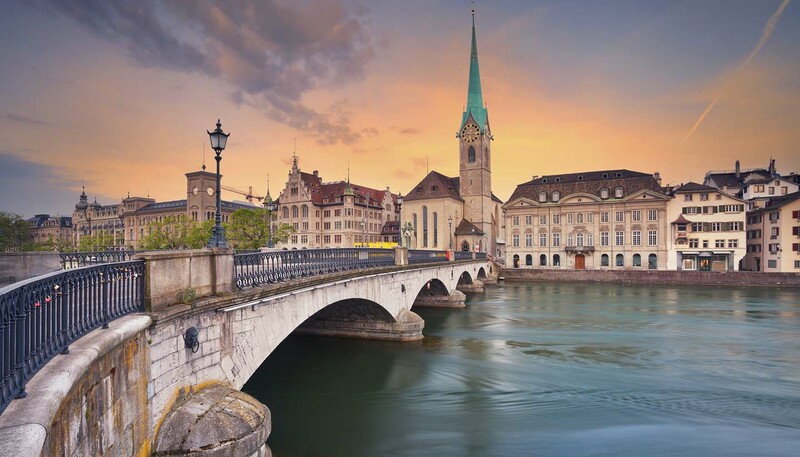 It may be home to one of the world’s largest stock exchanges and Switzerland’s financial motor, but step back from the share prices and you'll find a vibrant, trend-conscious city. Hang with the hip in Zurich West for a while. Its former warehouses and viaducts are now art centres, bars and quirky boutiques. Along Langstrasse, the city’s notorious red light district, you’re just as likely to take home a designer handbag as you are a piece of skirt. Zurich’s character booms from the speakers of the annual Street Parade, a mammoth techno festival that weaves through the city with DJs and dancers. There isn’t a banker’s tie in sight. If there are in the east bank quarter of Niederdorf, they’re loosened. These medieval streets are abuzz with cafés on corners, trendy taprooms and world-class restaurants. It’s easy to lose an afternoon absorbing its laidback atmosphere, especially in summer when the riverside adopts a beach vibe. Winter is special too. Under the spell of snow, the cobbled alleyways, fountains and stunning architecture of the Old Town were made for the stroke of an artist’s brush. Shoppers will love Zurich all year round, especially in the upmarket boutiques of Bahnhofstrasse, the city’s main shopping drag. But this is no longer a city for the smart set alone; there are plenty of unusual shops to be discovered down hidden streets. Sitting astride the River Limmat and the northern tip of Lake Zurich, Mother Nature smiles down on Switzerland’s biggest city. Architects were courteous in their additions too - just check out the Fraumünster and Grossmünster churches, which face each other across the river. Then, when you’ve had enough of the city’s diverse array of restaurants, first-rate museums and pulsing nightlife, there’s always the nearby Uetliberg mountain or a boat trip on Lake Zurich to enjoy – if only to catch your breath before diving back into the city’s delights again.